Join us the afternoon of Thursday, October 18th, for an exciting event! Following last year’s successful Mobile First Conference that featured sessions by our expert Guide builders and esteemed student affairs professionals, we’re looking to continue providing educational opportunities for our clients to ensure everyone drives the most value out of their campus app. Learn. Hear from our mobile implementation specialists about best practices for better utilizing the features in your app and how to better understand and act on your mobile data. Impact. Leverage these best practices to pull relevant data and metrics from your app and make informed recommendations that radically improve your programs. Network. Join the speakers and your peers in a discussion and a hands-on exercise that will allow you to learn from others’ success and share your own winning recipes. Building a great Guide is only the beginning; the real ‘utility’ of your Guide and app stems from your ability to engage students! In this 45-minute session, we will discuss the best marketing and promotion tactics to get your app into students’ hands. We’ll also examine creative adoption strategies, innovative features, and engagement approaches that’ll encourage students to use your app throughout the school year. Mobile solutions empower schools better than ever to measure their own departmental efficiency, student engagement, and much more. However, data analysis can sometimes present a daunting challenge (or, an impossibility) to many departments on campus. 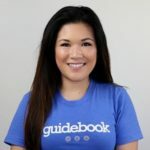 This short session will demystify metrics and outline how Guidebook’s world-class metrics suite can inform your school’s mobile app strategy. We’ll investigate promotion strategies, engagement tactics, and on-site adjustments, all through the lens of data analysis. Register now to reserve your spot! We look forward to seeing you on October 18th.